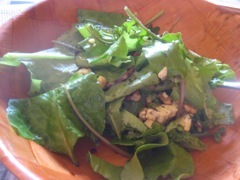 Feb 19, lunch. Chinese food at the Chinese restaurant near Adrienne's office. 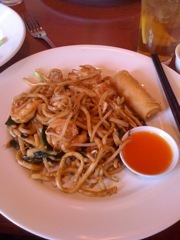 Shrimp and noodles. Good. The egg roll: bad, but what did I expect? With Adrienne. Feb 19, dinner. At Zemam's in Tucson with Mark and Rose. 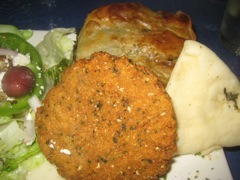 That little bit of green on the right under the Gored Gored is a zucchini pancake. Rose can't take gluten, so she usually brings her own injeera made of teff, but when she doesn't have teff or time, sometimes something else pops up. 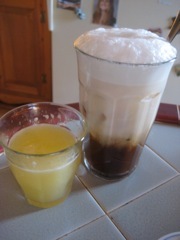 Feb 20, breakfast. The usual. Feb 20, lunch. 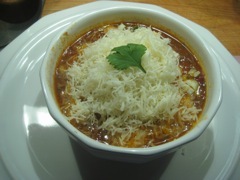 Leftover posole with a good helping of parmigiano and a lovely leaf of fresh cilantro. Yum! Feb 20, dinner. 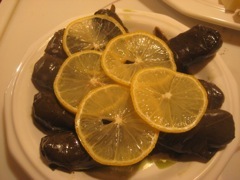 Grape leaves, stuffed with rice. At home in Tucson with Jan.
Feb 20, dinner. Grazing bits. 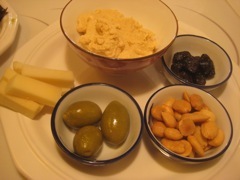 Olives, some cheese, almonds, and a bit of hummus. 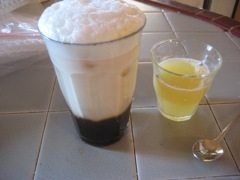 Feb 21, breakfast. The usual. Feb 21, lunch. 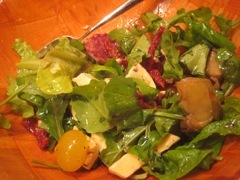 A green salad with greens from Jan's garden, salami, cheeses and so on. Feb 21, dinner. 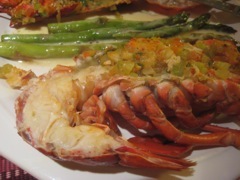 More on the baked lobster. Feb 21, dessert. Jan's birthday cake, made by her mom. Three layers, loads of lovely cream cheese icing, nuts, and delicious all the way around. 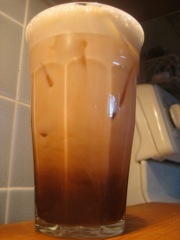 With ice cream and whipped cream if you wanted it! Feb 22 Jan's Birthday, Breakfast. The usual. Feb 22, lunch. Jan wanted to go to Opa! for lunch, so we did. 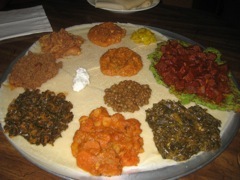 This is an appetizer platter. Feb 22, lunch. 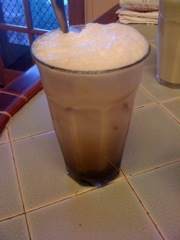 At Opa! with Jan, Face, and Christine. 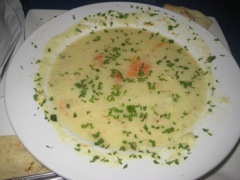 Avgolemono soup. Feb 22, lunch. 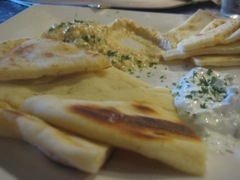 Greek platter from Opa! Feb 22, dinner. Grazing at home. 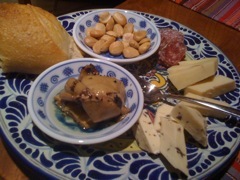 Grilled artichoke hearts from Italy, some hard and soft cheeses, salami, almonds, and a bit of bread from Beyond Bread in Tucson. 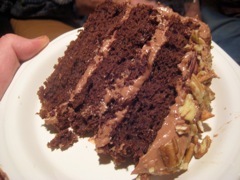 Feb 22, dessert. 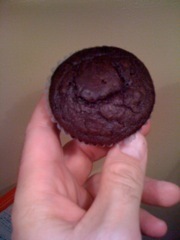 A little cupcake thingy. 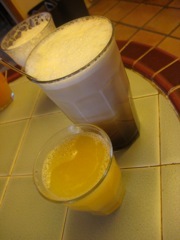 Feb 23, breakfast. The usual. Feb 23, lunch. 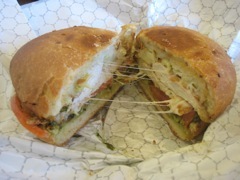 Chicken sandwich! Feb 23, dinner. Salad, as usual, plus a bottle of Chateauneuf-du-Pape (2001, Chante Cigale). Both outstanding. Feb 24, breakfast. The usual. Feb 24, snack. 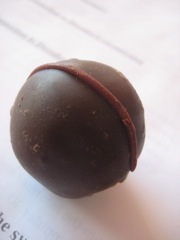 A Godiva Truffle. Yum! Feb 24, dinner. 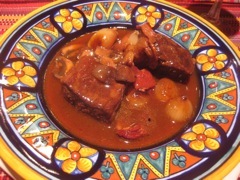 Bœuf Bourguignon, based on Julia Child's recipe in Mastering the Art of French Cooking. I also cooked the onions and mushrooms separately, using their own separate recipes, as she suggests. The effect is stunning. Feb 24, dinner. 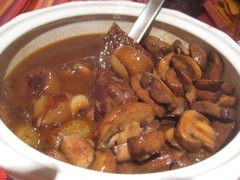 Bœuf Bourguignon, based on Julia Child's recipe in Mastering the Art of French Cooking. 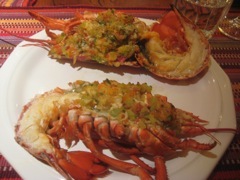 We had this with a 1990 BV Georges Le Tour Private Reserve. Feb 24, dessert. 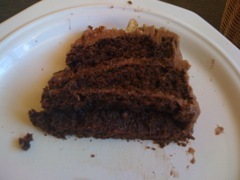 Leftover Jan's Birthday Cake. Yum. Feb 25, breakfast. The usual. Feb 25, dinner. 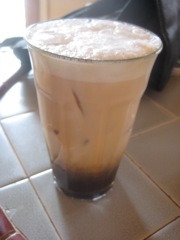 Rosa's in Tucson. 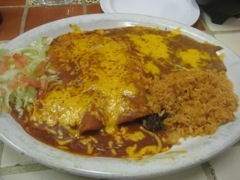 Carne seca enchiladas, with rice and beans. Lovely. Beyond lovely. Feb 25, dinner. 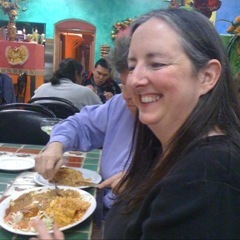 At Rosa's with Karen and Jan. Carne seca enchiladas, my favorite there. Feb 25, dessert. Jan's birthday cake. 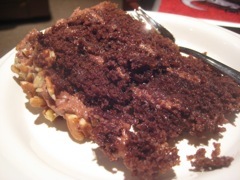 February 25, second dessert. 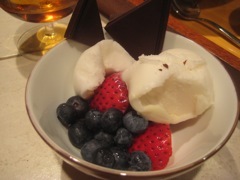 Lemon sorbet, strawberries, blueberries, and a bit of chocolate. At home with Jan and Karen O'Donoghue.